I’ve been internally sad these past couple of days. So this morning at the end of Mass, I closed my eyes, and I knew that deep down inside there had to be something stronger than me to hold on to. It being the Feast of St. Joseph, my favorite saint, I somehow imagined myself in the presence of the foster father himself and his spouse, Mary. They felt my quiet sadness, my discomfort. Mary said, “You need something to hold on to.” I replied, “Yes, but what?” In my head, I knew it needed to be something solid, something round, a bundle of something. Mary said, “Here.” And she handed me what was in her arms. Bundled in blankets, she put in my arms a baby boy ---Christ himself. This immense joy filled me as I held him close to my chest, squeezing hard but gentle. It reminded me of the time two summers ago when I went back to visit Costa Rica. At the end of my week long trip, I stayed in a hermitage---a log cabin built for one on top of a hill of the grassy acres of the land owned by the Franciscans. I remember walking around the cabin for the first time, a small kitchen built for one, bed room, and an extra room built for one to sit and kneel---a chapel with a tabernacle in it. It was empty though. Before I retired my first night eating dinner at the friary, the priest took me to his chapel, unlocked his own tabernacle to take out a piece of blessed Jesus Himself in host form. He put Him in a metal container, wrapped Him up in white cloth, and handed Him to me. My eyes widened. My heart beat hard. This is Jesus. And I get to hold Him? I get to bring Him back to my log cabin and keep Him there just for me? This is unreal. What a tremendous privilege. One of my more delicately intimate moments in my life was when I had to hold Jesus close to me, wrapped in that cloth, walking up the rocky, dark path back up to the hermitage. I didn’t want to trip, I didn’t want to fall, and I definitely didn’t want to drop what I was holding. I imagined that were I to stumble forward, I would turn and fall on my back to keep Christ protected. It was as if I was holding the baby Jesus himself that I imagined myself holding this morning. The boy, my savior, my love, the Eucharist, the flesh that forever brings me back and keeps me solid. What joy. 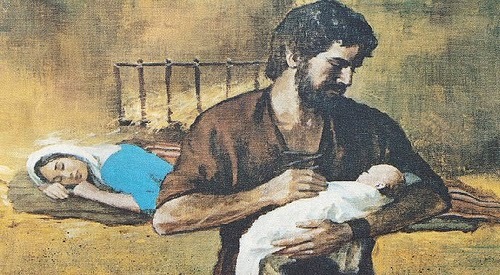 Here’s to the Feast of St. Joseph, true protector of the child Jesus. May we all protect and cherish the Christ child in all of us. Amazing.. All we need is Him.